This entry was posted in Libraries and tagged civil war, libraries on July 18, 2013 by Wire Eagle. AUBURN UNIVERSITY – The Special Collections and Archives Department of Auburn University Libraries has added another significant historical document to its collection of materials documenting the American Civil War. Through a donation by the family of Nancy Eckert Galbreath, the Thomas Thompson Eckert diary has become a permanent part of Special Collections and Archives’ documents available to scholars studying this chapter of American history. The Eckert diary, with entries written between Jan. 2 and Dec. 1865, offers a glimpse into a time when the United States was preparing for the end of the Civil War and the period immediately after. Eckert, at the time the general superintendent of military telegraph at the War Department with the rank of major, was a confidant of President Lincoln and Secretary of War Stanton. He participated in the failed Hampton Roads peace conference in February 1865 and was at Lincoln’s bedside when the president died on April 15, 1865. This entry was posted in Libraries and tagged civil war, library, Naval on April 30, 2013 by Wire Eagle. AUBURN UNIVERSITY – An exhibition of historic items representing American postal, Civil War, Alabama and naval history will be on display through August in the Special Collections and Archives Department of the Ralph Brown Draughon Library. The pieces in the exhibition were donated to the library by John and Faye Vick of Andalusia. This entry was posted in General News and tagged civil war, libraries on February 22, 2013 by Wire Eagle. AUBURN UNIVERSITY – Auburn University Libraries has acquired a rare collection of Civil War papers and documents that offer insight into the peace negotiations that took place between emissaries of the Union and Confederacy aboard a steamer at Hampton Roads, Va., in February 1865. The Hampton Roads Peace Conference is featured prominently in the movie “Lincoln,” which has been nominated for 12 Academy Awards. The papers will be added to the Ralph Brown Draughon Library’s Special Collections and Archives Department, supporting the already rich physical collection of Civil War-related material preserved there. They will also be digitized and made available to researchers and Civil War historians around the world. This entry was posted in Alumni, Community, General News and tagged auburn, civil war, letter, ulysses s. grant on June 12, 2009 by Wire Eagle. AUBURN – Auburn University recently acquired a letter documenting one of the more dramatic moments in American history: Robert E. Lee’s surrender of the Army of Northern Virginia. On April 9, 1865, Lee met with Ulysses S. Grant at Appomattox Court House. 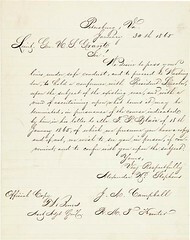 In a letter of the same date, Grant gave Lee the terms of surrender.